Duncan and Hunain – Winners! Well done to all the students from Franciscan College Gormanston who took part in Poetry Aloud at the National Library today. Each student delivered his two poems with skill and passion. The students did themselves proud. A very special congratulations goes to Duncan Walker and Hunain Saqib who have advanced to the second round of the competition. They were two of only five students who progressed from our heat. The Gormanston boys at Poetry Aloud. 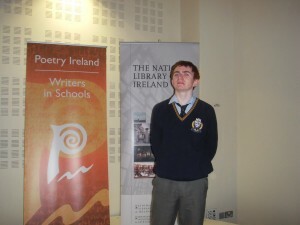 Duncan Walker – through to second round of Poetry Aloud competition. 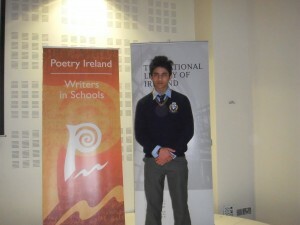 Hunain Saqib – through to second round of Poetry Aloud competition. We would like to say well done to the other competitors today. Each school should be proud of their students. Thank you, also, to the National Library of Ireland for hosting the event. Tomorrow, 25th October, 11 students from Franciscan College, Gormanston will take part in the Poetry Aloud competition run by the National Library of Ireland. The students must recite one prescribed poem and a second poem of their own choice from one of the prescribed anthologies. In the Junior Category the prescribed poem is ‘An Irish Airman Foresees his Death’ by William Butler Yeats and in the Senior Category the prescribed poem is ‘Postscript’ by Seamus Heaney. The second poem recited by the students must come from ‘The Rattlebag’, ‘Lifelines’ or ‘Something Beginning with P’. These students have worked very hard to learn these poems and practise reciting them with passion and emotion. We wish them the best of luck tomorrow and hope that their hard work will pay off! As we prepare to study the poetry of William Wordsworth, it is worthwhile taking a brief look at Romantic Literature in general. Here is a list of some of the poets and writers that you may be interested in researching. Some of them you will be familiar with already. This video is also worth a look. It gives a brief overview of the Romantic style and themes. 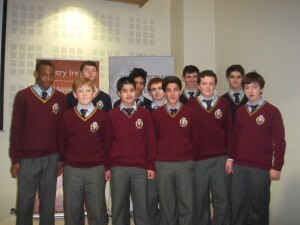 Students at Franciscan College Gormanston are currently composing essays for the John West Fantasy Writing Competition. 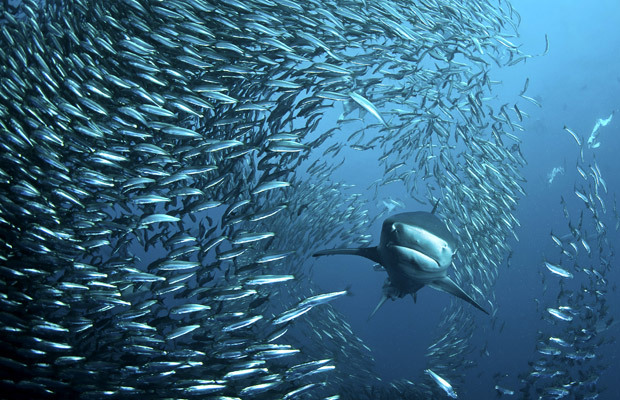 The theme this year is ‘Under the Sea’ and students are free to explore any aspect of this theme that they wish. They are writing essays about mermaids, sea monsters, underwater aliens, pirates, the lost city of Atlantis and other kinds of deep sea adventures. Remember that a great way to get inspiration for your writing is to read as much as possible; and the best way to become a great writer is to practice writing as much as possible! ‘What hands are here! Ha! They pluck out mine eyes. ‘Confusion now hath made his masterpiece! And yet dark night strangles the travelling lamp. ‘Avaunt! and quit my sight! 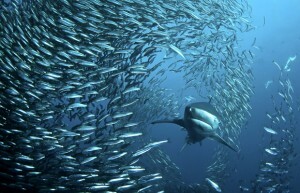 Let the earth hide thee! ‘I have almost forgot the taste of fears. Simply knowing these quotes is not sufficient for a Higher Level essay on ‘Macbeth’. You must also be able to state the role and function of this bloody imagery, write about why it is included in the play and how it adds to the themes of the play. Perhaps you may like to comment below to practice writing your opinions on these topics!! 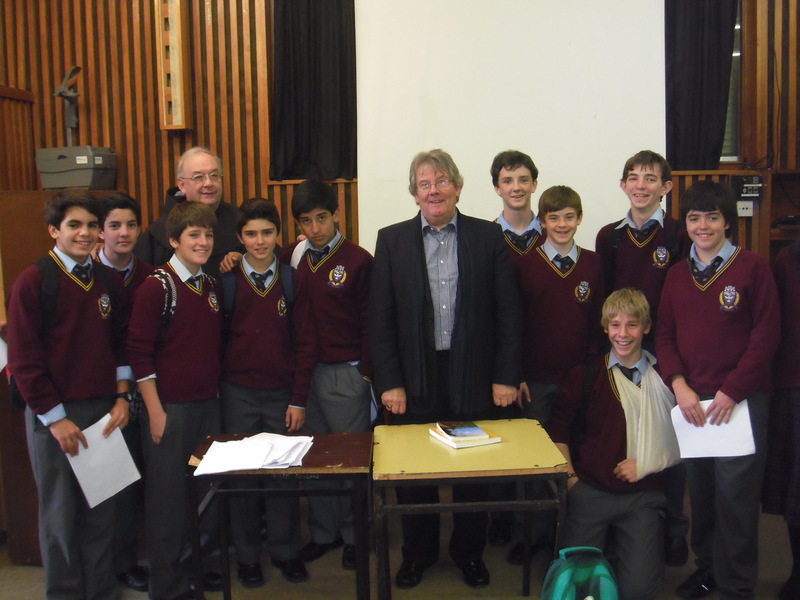 What a wonderful visit we had today from the poet Noel Monahan! 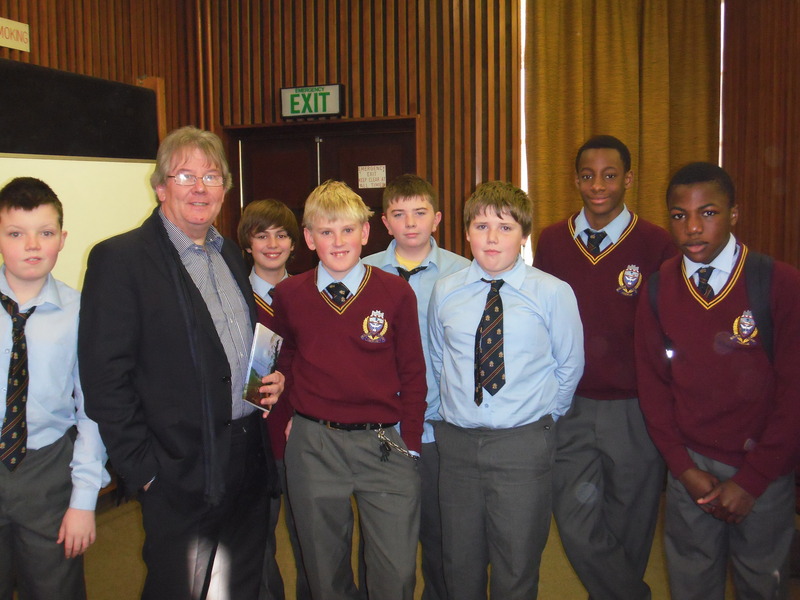 Noel spoke with 1st and 2nd year students about his poetry and his life as a poet. He described his idea of ‘wordfarming’ and how he gets his inspiration to write his poetry. We were given the treat of a reading of his poems ‘The Funeral Game’, ‘All Day Long’ and ‘Drumlins’. Students were encouraged to ask questions and Noel was incredibly generous with his in-depth answers and descriptions. The English Department is eagerly awaiting tomorrow’s visit from poet Noel Monahan! He will speak with first and second year students about life as a poet, where he gets his inspiration from and how he approaches the craft of poetry writing. His collections of poetry include ‘Curse of the Birds’, ‘Curve of the Moon’ and ‘The Funeral Game’. We will post tomorrow about how things went! Here are just some of the quotations from Act I of ‘Romeo and Juliet’ that you should know off-by-heart. Cankered with peace, to part your cankered hate. ‘Here’s much to do with hate, but more with love. O anything of nothing first create! She hath not seen the change of fourteen years. ‘But woo her, gentle Paris, het her heart. Herself poised with herself in either eye. ‘I’ll look to like, if looking liking move. ‘O, she doth teach the torches to burn bright! Did my heart love til now? Forswear it, sight! ‘This, by his voice, should be a Montague. To be a virtuous and well-goverened youth. This holy shrine, the gentle sin is this. Which mannerly devotion shows in this. ‘My only love sprung from my only hate! In response to the above statement, write an essay on poetry of Hopkins. Your essay should focus clearly on the reasons why the poetry is appealing and should refer to the poetry on your course. Discuss this statement in its entirety, supporting your answer by reference to the poems by Hopkins on your course. To what extent would you agree with this assessment of the poems of Hopkins studied by you? Support your points by suitable quotation. Discuss the poetry of Hopkins with regard to the above statement. You have been asked to create an anthology of poetry. What poems by Gerard Manley Hopkins would you include? Give reasons for your answer. The book of the month for Franciscan College Gormanston is Mary Wollstonecraft Shelley’s ‘Frankenstein; or the Modern Prometheus’. This book is part science-fiction and part Gothic and was first published anonymously in 1818. 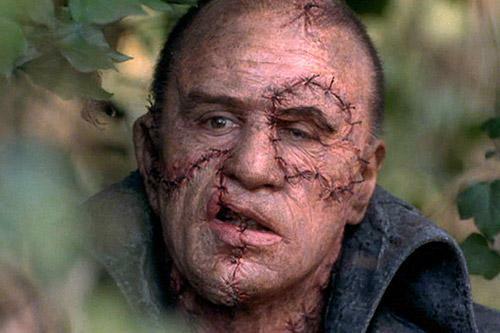 The narrative is introduced by Captain Walton, an explorer who encounters the emaciated Victor Frankenstein. 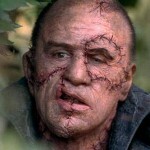 We become as curious as Walton to discover more about the mission that Dr. Frankenstein is on. The novel has been the subject of many adaptations and hold the imagination captive. As always, we encourage as many students, parents, past-pupils and staff members to comment here and let us know your opinions on the book.